Aston Martin is currently recalling two-thirds of all of their cars it's made in the last six years over 'counterfeit plastic' in their throttle pedals. The general manager of the company Aston blamed is now all like 'say whaaaaaat? Oh no you didn't." Aston Martin specifically blamed Shenzhen Kexiang Mould Tool Co. for producing the counterfeit plastic. You can read a good explainer of what the hell counterfeit plastic is right here (hint, it's not good). In any case, the Wall Street Journal's China Real Time blog now reports that the general manager of Shenzhen Kexiang Mould Tool Co. is denying any knowledge of the fake-plastic/Aston Martin deal. When China Real Time talked to Shenzhen Kexiang Mould's general manager, Zhang Zhiang, last week, he said wasn't aware Aston Martin was one of his clients. 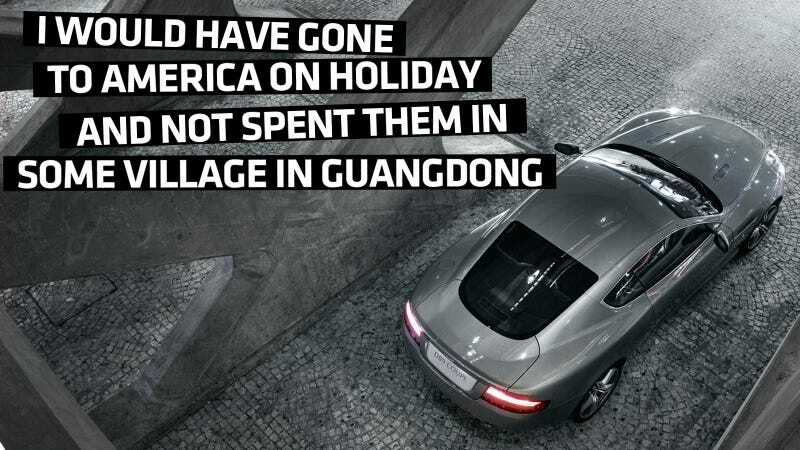 "If I knew I had customers like Aston Martin, I would have gone to America on holiday and not spent them in some village in Guangdong" province, Mr. Zhang said. The WSJ goes on to explain that the Chinese government's official organ the People's Daily called Aston Martin 'unprofessional' for blaming made-in-China products. Leaving that aside, I'm pretty sure Shenzhen Kexiang Mould Tool Co. is winning the PR battle against Aston at the moment.